It's my birthday next Saturday. I will be 38. I'm a little shocked by this. When did that happen? I don't feel wise enough to be 38 because surely the closer I get to 40, the wiser I should be. I have no issues with getting older. I don't mind the laugh lines, I've laughed a lot so I deserve them. I don't mind that I can't pull all-nighters like I used to, I like Sunday breakfast too much. And I don't mind that I've already done some fashions twice, anyone else done pastels, jumpsuits and shoulder pads a couple of times? I still find myself saying " when I grow up". When I grow up, I'm going to be...... Luckily for me, when I was little and said 'when I grow up', I wanted to grow up to have a dress shop. Really the signs that I would have the shop were obvious. I clearly remember grabbing all my clothes out of my wardrobe, throwing them on the floor and dramatically throwing myself on top of them, declaring I had nothing to wear...to the Bluelight Disco when I was 12! So as this is my last post as a 37 year old, here are some things I know: don't wear something just because it is fashion (my height and age stopped me from wearing baby doll dresses a LONG time ago); if you can't feel your toes, the heels are too high; if you can't feel your legs, the skinny jeans are too skinny; if you require assistance to get into a dress, you will never ever wear it; if you go shopping after a break up, after too much sugar or hungover, you will never ever wear whatever you buy; and just because you CAN wear it, doesn't mean you should. My next post, at age 38, will no doubt be full of wise words, because I'll be closer to 40. 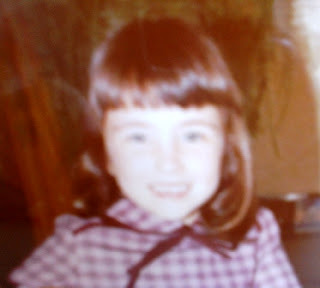 But until then, here's a photo of me looking rather trendy in purple plaid (must have been in the 70's then). Not sure I'll be looking so fresh faced next Sunday after birthday shenanigans.